Nose: Malty with stewed lemon and green, vegetal notes, followed by sweet, earthy notes: angelica, dandelion and burdock, and sarsaparilla. Mulled wine, too. 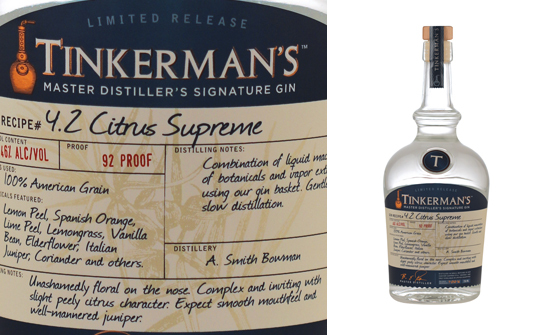 Palate: Woody anise which brings some pleasant oiliness, followed by wintergreen, rose and orange blossom. This leads onto warmth from citrus oil. Finish: A little resinous pine and an intense, oily citrus that lingers with notes of cilantro. Comments: An intense gin which is slightly disjointed, but will likely stand up well to an American tonic. Nose: Herbal and summer meadow notes along with citrus fruits and a hint of juniper. Palate: Oily with floral notes, orange, nutmeg, cardamom, angelica and bitter almond. Finish: Fiery and nutty, with a slightly aggressive bitter edge and alcohol burn. Comments: This needs to be mixed, either with tonic or in a cocktail, because the alcohol is otherwise too aggressive. That said, its high strength means its flavours will shine through and hold their own in any serve.